When The Four Immigrants opened and folks asked me how I was feeling, my response was something like "Great, but also overwhelming. I think I'm going to be processing this incredible ride for months to come." Now that the show is closed, I am confronted with just how mind-blowing this whole experience has been. Those who know me know how much I love lists, because they help me organize my thoughts. So, in no particular order, here is a list of four mind-blowing moments from the TheatreWorks rehearsals and run of The Four Immigrants. Early in the year, TheatreWorks flew me out to New York and Los Angeles for auditions. This was the first time I have ever been flown to other locations to search for actors. In New York, we were auditioning at Pearl Studios. Several other productions were holding their own auditions in other rooms, including Disney's Frozen (both the Broadway and the California Adventure calls). It was thrilling to consider how many Broadway writers, directors and performers had been in and out of this building! I am floored by how many people came to see the show, particularly those whom I have not seen in such a long time! Folks from every "era" of my life — friends from high school, college, my childhood church, my old corporate job; family members; and colleagues from theatre — surprised me with a text or e-mail saying they were coming to or were at the show. My heart is filled with warmth and gratitude at the outpouring of love and support for the project. Akiko Kiyama, the granddaughter of Henry Kiyama (author of the original comic book), flew to California from Japan with her husband Ken'ichi just to see our production of The Four Immigrants. Both were very moved by the performance. Afterwards, when Akiko saw actor James Seol (who plays Henry in the musical), she called him ojiisan - "grandfather." Everyone in the room could sense how special this moment was. There were smiles and tears all around - and lots of photos taken. 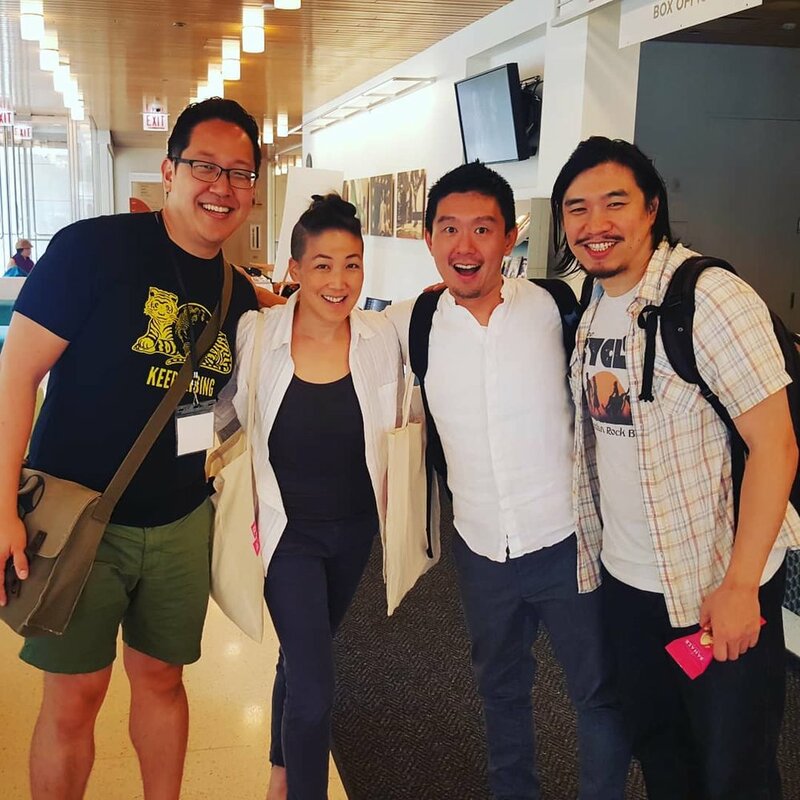 While I've been blown away by the positive response from audiences, the reactions from other Asians/Asian Americans have been particularly poignant: how the show made one man feel "proud" to be Asian, how it helped a wife (Asian, but not native to the States) understand more of what her Asian-American husband might have experienced growing up, how a Japanese American felt that the show honored the history of her family and heritage. I've also heard from folks who aren't Asian, but identify as immigrants or are closely connected to their immigrant lineage, saying the show conveys emotions and sentiments they identify with deeply. I'm honored to have created a vehicle for people to process or experience catharsis of some kind — and hopefully keep them entertained along the way. Thank you to everyone who came to see the show, or who supported it from afar! And of course thank you to the entire cast, crew, creative team, and TheatreWorks for the unforgettable ride this was! Posted on August 8, 2017 by Min Kahng and filed under Adaptation, Composition, Career, Creative, Musical Theater, Performing Arts, Representation, Thought, Writing and tagged TheatreWorksSV Asian American Four Immigrants.